the temperatures have dropped noticeably, which i actually really enjoy. i enjoy the drizzle, the fog, the chilly air that crawls underneath your skin. and with the cold, as reliable as a swiss watch, i start to crave comfort foods. 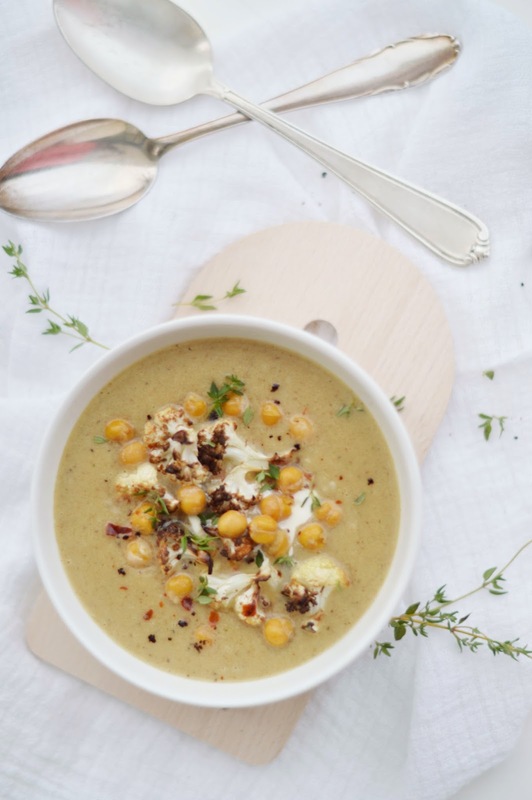 anything hearty, i’m in for the deal: cakes, stews, roasted vegs, soups, cheeses, pasta… here, i even managed to combine two fall perks in one dish: roasted vegs – incorporated into a hearty soup with just the right amount of nutty flavor and crunch. i have a feeling this soup is going to be a staple around here for the next couple of months. preheat the oven to 220° c / 420° f and line a baking sheet with parchment. 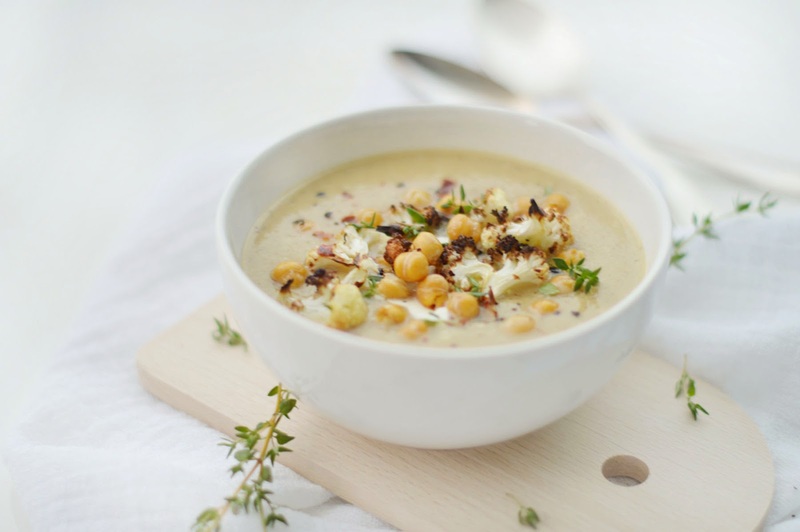 cut the cauliflower into florets, drain and pat dry the chickpeas. place on the sheet together with the garlic cloves (whole). sprinkle everything with olive oil and season with salt and cumin. roast for about 20 to 25 minutes, until the vegs are golden and in places charred. in the meantime, heat a little more olive oil and gently sweat the potato cubes. add water and broth and bring to a boil. cook until tender. add the roasted cauliflower, and chickpeas (spare some for the garnish) and garlic and heat through. puree with a food blender. add the heavy cream, bring to a boil. season with salt and pepper. serve in bowls, topped with a dollop of crème fraîche, the leftover cauliflowers and chickpeas, some thyme leaves and a sprinkle of paprika flakes. This sounds wonderful! 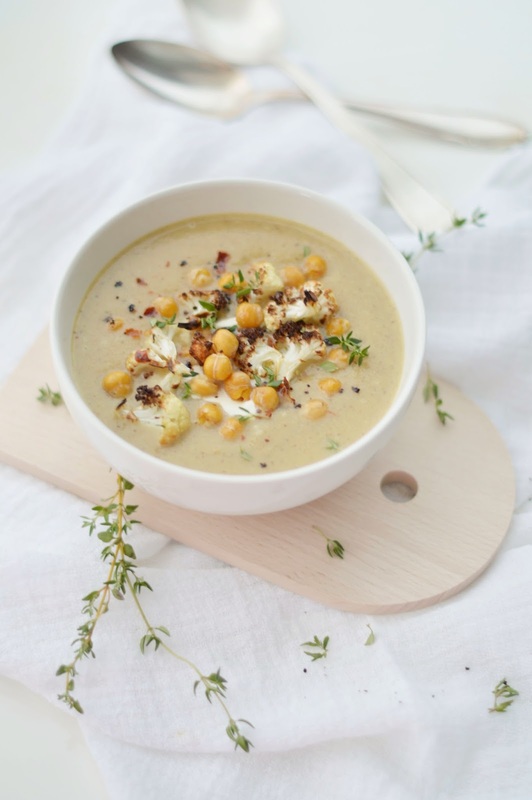 I had a creamy chickpea soup a few months ago that I LOVED and I have been wanting to make some ever since! Awesome clicks! Looks so delicious, I am surely going to try this! Could you look at the amount of vegtable broth? I'm not sure how much Looks yummy! did i just answer that correctly? in short again: start with 2-3 glasses of water, then add more, should need be, depending on your taste. i agree, it's delicious! and so fall-y. just tried it and it was oh so yummy! and we were thinking of you of course whilst eating it! <3 aaaw…. i love that you made it! it was good, i believe? tonight another soup is on, and the best ingredient will be: togetherness! can't wait! Hi this looks delish! I want to make it. Can you tell me what fleur de sel is and where I can get it? Also does it have to be heavy ream or can I substitute that for something a little lighter? This recipe really looks good. I am going to veganize it a bit and omit the dairy and I will report back. I am sure it will be delicious! I would try substituting fat-free evaporated milk for the heavy cream. That's what I usually use. fleur de sel is sea salt.